Much like a beautiful bathroom vanity, the mirror you choose for your space can serve as a focal point in the room. And, because it is used each day by every member of the family, a mirror can be the one of the most looked-at pieces in your bathroom. Installing a new mirror, along with other new bathroom accessories, is an easy way to instantly update the look of a room. But design experts say that homeowners can breathe new life into their existing mirrors as well by repairing imperfections and adding a new frame. A product called MirrEdge makes adding a frame to a plain mirror simple and inexpensive. In just a few minutes, the kit can help transform a plain unappealing bath or vanity mirror into one that will change the whole look of the room. This do-it-yourself mirror framing system can also be used to cosmetically conceal deterioration that appears over time on the bottom and edges of mirrors. 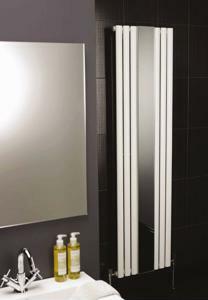 The system works on mirrors that measure up to 60 by 60 inches. For smaller mirrors, the framing can easily be cut to size. Kits are available in dark cherry walnut, vibrant royal oak and white dove with color coordinated corner plates so they can match the décor and color in any bathroom.